Michigan has a prestigious reputation for producing some the greatest musicians of modern time. From Alice Cooper to Eminem and even the twisted act Insane Clown Posse, the state has a wide variety of famous musicians who have hugely impacted music, whether good or bad. The trend continues with Pop Evil, the latest band to shake up Michigan’s music scene. War of Angels, the recent release from the Michigan-bred rockers, has once again infected the rock n’ roll world with their catchy riffs and memorable stage presence. Maximum Ink’s Aaron Manogue talked with lead singer Leigh Kakaty about their Michigan roots, new album and touring with 3 Doors Down and Theory of a Deadman. Maximum Ink: It seemed like it took forever for your guys’ second album to come out. What was it like to finally release it and receive such praise from your fans? Leigh Kakaty: It was very gratifying to finally have our album released and to have the success that it did. Felt like it was never going to come out after all the delays we had. We are grateful to be in the position we are in now: at a new label who believes in our music. Maximum Ink: What was it like working with producer Johnny K, who has worked with just about every major band out there today? Kakaty: Johnny K was a true professional. He was able to help us establish our identity as a band and give our music the sonic quality we have always tried to attain in the studio. His leadership and guidance were essential in making this album a true master piece. He helped give us an album we are all proud of and something that hopefully will be around for many years to come. Maximum Ink: The first single off the album “Last Man Standing” really reaffirmed your place among today’s top bands. Tell me about that song and what it’s all about? Kakaty: LMS has been a key song in the career of Pop Evil no doubt. It was written during a tough time with our old label. We didn’t know where we were going to end up. The song speaks to those who have been held down and still believe in themselves. We have always known we could write songs, but [in an] ever changing landscape that is rock music it has become harder and harder to break out from the pack. With a much heavier guitar style than our fans were used to, we decided to make a statement with this song. That statement was: We are here and aren’t going away, that at the end of the day, is what being the last man standing or the last band standing is all about. Maximum Ink: The entire album is very eclectic, from hard rock like “Last Man Standing” to a more toned down feel with “Monster You Made.” How do you guys manage to create music between the extremes hard rock and rock ballad? Maximum Ink: It’s football season, so I thought we’d talk a little about your song “In the Big House” blowing up in Michigan, where you guys are from, and around the University of Michigan campus. I’m a Wisconsin Badger fan, so I know the prestige that goes along with supporting your state’s best football school. Tell me where it came from and what it means to you to support your team in such a cool way. Kakaty: Yes, we are a Michigan band and very proud of where we come from. With a lot of our friends and family struggling during this economic recession we seem to be in, it is very important to us to give back to those people who have helped us get to where we are. [...] We are very influenced by sports, and we wanted to do something to put a modern day twist on a rock ‘n roll fight song. The Michigan Wolverines were the obvious choice for us Michigan boys. We are very surprised but excited on how quickly the song has caught on. Hopefully it continues to grow and is around for a very long time. Maximum Ink: You’re about to embark on a long tour with Theory of a Deadman and 3 Doors Down. What are you looking forward to the most? Kakaty: We are very excited about this tour. What I’m probably looking forward the most on the is all the new people [and] fans we will meet. With 3 Doors Down and TOAD being such big names, there will plenty of people out at these shows that have never seen or heard of us before. That is the challenge every night: winning them over. Hopefully we will gain a new audience once it is all said and done. Maximum Ink: What’s it like to gain so much popularity so quickly in comparison to some bands that have been at it 10-12 years trying to make it big? Kakaty: Honestly I don’t see it like that at all. I feel like we still have so much room to grow. I still consider us a baby band, and I cannot wait to expand on this momentum we have seemed to acquire over the past year. You know me I am singer so I am never satisfied. Maximum Ink: What’s next for Pop Evil after the upcoming tour? Any plans as of yet? Kakaty: More touring. We are going to tour ‘til the wheels fall off of this record, then we are going to get back in the studio and do it all over again. 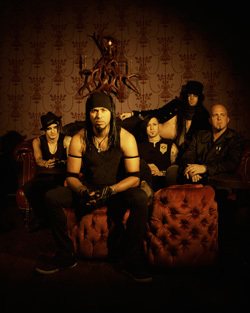 True road warriors is what Pop Evil is all about, so get off your couch and come out to the rock show.